I’ve not been crafting because I was STUCK. I had to make this card. I didn’t know what to make (male birthday, personal use). I could not get past it. I pulled out other stamps, thinking if I created something, ANYTHING, it would help me move forward. Ugh. My mojo scurried even farther under the couch. I finally settled on this birthday stamp, and I was going to make it an underwater scene, with seaweed & fish. I started down that path, and realized I needed a bigger card (which would need more space filled in with underwater things), and my deadline (Thursday AM) was quickly approaching. So, how about just a sign, sitting on the beach? I stamped the sign first, then masked it and blended ink around it. Have a nice weekend! I’ll be trying to coax my mojo out from under the couch. Supplies: Stamps – Hero Arts, My Favorite Things, Stampin’ Up!, paper – ESSE Pearlized Latte, Neenah Classic Crest Solar White, Stampin’ Up! 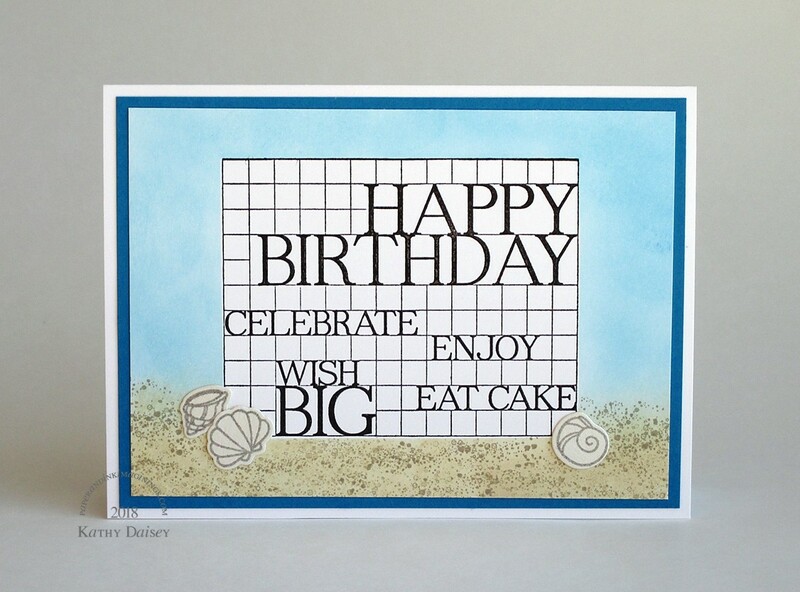 Pacific Point, inks – Stampin’ Up! Crumb Cake, Tim Holtz/Ranger Distress Inks Antique Linen, Salty Ocean, Tumbled Glass, VersaFine Onyx Black, Smoky Gray, dies – My Favorite Things, embossing powder – Filigree Fine Art Powder clear. Categories: birthday, card | Tags: card, ESSE, Hero Arts, My Favorite Things, Neenah, Ranger, Stampin' Up!, Tim Holtz, Tsukineko, VersaFine | Permalink. Oh I’ve been stuck before too! Looks to me like you are now “unstuck” 🙂 Your card is so cute, I love it! Hope your mojo keeps coming back! Oh, Beth, thank you! I don’t think the mojo is all the way back – I even vacuumed under the couch yesterday, hoping it would come scurrying out (no luck!). Thanks, Mike! It has been gone for about 10 days, not sure it will find the way home in the misty weather!